The Idemitsu Museum of Art is one of the most highly regarded private museums in Japan. 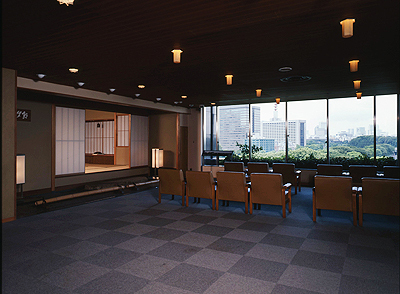 Located in the heart of Tokyo’s prestigious Marunouchi business district, the serene gallery space showcases some of the rarest and most representative collections of East Asian antiques and provides a splendid view of the Imperial Palace ground. Its outstanding collection amassed by Idemitsu Sazo (1885-1981), founder of Idemitsu Kosan Co. Ltd and the Museum, over the course of 70 years, counts around 15,000 objects, including two works designated as National Treasures and 54 items as Important Cultural Properties. 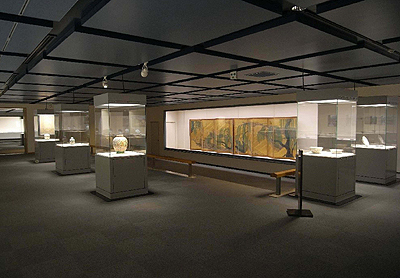 The Museum is world famous for its outstanding Japanese paintings, calligraphy and East Asian ceramics. Idemitsu Sachiko, curator at the Idemitsu Museum of Art and Assistant Professor of Japanese Art History at Aoyama Gakuin University since this spring, talks to Mizutori Mami about her late grandfather and museum founder Idemitsu Sazo and his collection. 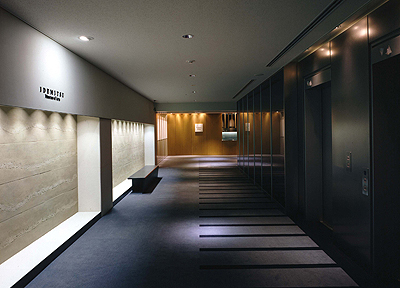 Lobby area of Idemitsu Museum of Art. Image courtesy of Idemitsu Museum of Art. Mizutori Mami: Japan has many outstanding museums built on private individuals’ art collections, and the Idemitsu Museum has long been regarded a premier museum of such kind. Serving as an oasis for art lovers since 1966, what is the secret to the Museum’s success? Idemitsu Sachiko: The Idemitsu Museum’s main purpose is to display the art privately collected by my grandfather and the company founder Idemitsu Sazo to the general public. In a way, the museum is like a vessel that keeps alive the ‘spirit’ of Sazo. Reflecting his personal taste, our collection of two-dimensional works has only a few academic paintings—like those done by official government appointed Kano school painters—and instead is dominated by literati paintings. These include images by both established and amateur artists that are in a style that viewers can easily access and appreciate. Sazo once referred to his collection as ‘that which begins with Sengai and ends with Sengai’1. The founder’s first acquisition was in fact an ink painting by monk Sengai of ‘Hotei pointing at the moon’. The image explores the complex world of Zen in a witty affable rendition typical to Sengai’s work. The sense of familiarity and charm in all of his collected works can be felt throughout. Whether we arrange in our display cases calligraphy by Sengai, paintings by Kosugi Hōan (1881-1964), an early 20th century Western-style turned Japanese Nihonga painter, or delicate porcelains by Itaya Hazan (1872-1963), although they come from different genres of art, somehow the objects beautifully resonate with each other. Sazo led a company during a thriving yet fiercely competitive period and he turned to art in search of peace and tranquility. His gentle way of appreciating beautiful objects can be felt across the collection. The objects are less about didacticism and more about viewers’ experience of finding comfort and joy in the objects. This appreciation for ‘sublime beauty’ is what makes the collection so attractive to many who come to visit us time and again. Image courtesy of Idemitsu Museum of Art. MM: What is your first memory with the Museum? IS: The most vivid memory I have is of seeing the Turkish Civilization exhibition held at the Museum when I was still in elementary school. Upon entering, I was astounded by the impressive set of Roman statues. And was impressed by the curators who were diligently explaining the significance of the objects to the visitors. They stood tall doing the job they felt passionate about and I was rather attracted to them. MM: It seems you discovered your life calling at an early age. IS: Actually, not so. At university I studied economics, in fact international finance, with the expectation of a career in the world of finance. It was my mother who provided me the window of opportunity to the world of art. She was a flight attendant at a time when not many women had a proper career and were normally expected to get married instead. She was the one who encouraged me to obtain curatorial qualifications, believing that it just might one day come in handy. Soon before starting corporate life, I suddenly became very disenchanted by the world of business and instead became increasingly drawn to the arts. I think the curators I saw in my youth left a lasting impression as my heroes: their knowledge, confidence and passion to create and deliver great exhibitions were to me what amazing adults did. I decided then to seek the advice of Professor Kawai Masatomo, who was then teaching Japanese art history at Keio University. A bold move in retrospect, but I asked to take the admission examination for their MA art history programme despite having no formal undergraduate training in the discipline. Fortunately I passed the exam and with that my future trajectory changed completely. MM: The Idemitsu Museum is also going through positive developments with the recent opening of the Northern Kyushu Idemitsu Museum in Moji. IS: Historically there were three Idemitsu Museums: in Tokyo, Osaka and Fukuoka. Sazo was very fond of Moji, since it was there in the major trade port of Fukuoka, that he started his business in 1911. When he was reconsidering the overall future impact of the museum, he hoped to open a branch in Moji. It was only after his death without himself realizing this dream that Mr. Shosuke Idemitsu, the current director and son of Sazo, closed the Osaka and Fukuoka branches and instead opened a new museum in Moji Retro Area. Moji seaport thrived in the mid-Meiji era as a home port and cargo port to primarily handle coal. At one point it dominated as the principal port in Kyushu, but gradually lost its influence as trade with Mainland China dropped after the end of World War II. In recent years, the site has been redeveloped using the old historic fabric of the port buildings, including the train station. In 1995, the district officially reopened as Moji Retro Area and has become a popular fashionable tourist site. MM: What is your favorite object in the Museum’s collection? IS: For my PhD thesis, I chose to write on an Edo period literati painter called Ikeno Taiga. The soft handling of the brush seen on Taiga’s paintings echos that found in Sengai’s work. Images by Chinese literati painters, who turned to art after devoting their life to civil service after passing an extremely competitive entrance exam only to be tormented by abusive superiors, let their feelings of frustration and despair creep into their paintings. On the other hand, literati painters in Japan populated a world appreciating the arts in a more relaxed atmosphere, similar to that of French salons. The work of Taiga, who was very much part of the Japanese literati world, conveys tenderness and humour that in particular are similar to the personable quality found in Sengai’s work. It is of course difficult to decide on a favorite piece, but I do have a special fondness for Taiga’s ‘Jūnikagetsu rigō sansuizu’ pair of 6 panel folding screens. Each of the twelve landscapes capturing the year’s changing seasons can stand alone as a unique painting in itself, but they take on a much greater visual narrative when put together as a folding screen. If you look closely at the images, you’ll see that the details are created in a technique similar to pointillism. Interesting, I think, as Taiga was using a similar technique Van Gogh used over a hundred years earlier. Taiga was known to paint outdoors when the weather was fair. Perhaps this inspired him to depict the beautiful colours of the light using only dots. MM: You spent time in the UK while working on your doctoral thesis where you became involved with the Sainsbury Institute. Could I ask what prompted you to spend time overseas? IS: To put it simply I nearly burnt out while trying to write my thesis. I literally got stuck ploughing through the overwhelmingly vast materials on one of Japan’s most esteemed painters. Seeing my state, my then supervisor Professor Kawai strongly urged me to continue my research but in England. He said that just because my research involves a Japanese painter does not mean I have to physically stay in Japan. So I moved to London. That was where I met another former Keio student of Professor Kawai and Director of the Sainsbury Institute, Professor Nicole Coolidge Rousmaniere (currently Founding and Research Director). As a result of this serendipitous meeting I was eventually able to benefit from the Institute’s fellowship scheme to continue with my research. The experience was interesting. I found myself working with only limited resources than those I had available back in Japan, which in fact was a positive thing: I was able to focus better and see my research structure more clearly. I also had opportunities to present my research in the form of colloquia that helped me to rethink the direction of my research. I later returned to Japan and continued to present my ideas with new insights and better articulated thoughts. I eventually completed my thesis, which happened almost naturally. In England, I learned about the different presentation and writing styles and found that regardless of the excellence of one’s research, no one will listen if the presentation is poor. I was also surprised to find that one does not necessarily need a fully developed research topic to make a presentation. If one could present in an interesting and thought provoking way, colleagues would help to develop one’s research further. Furthermore, the most important discovery for me while researching in the UK was to learn how to develop connection with those interested in learning more about the beauty of Japanese art. With these realizations, my own research became much more meaningful and as a result I was able to enjoy completing my dissertation. MM: What are your future project plans? IS: I learned the joys of studying art during my time in England. I would like others to experience this sense of fulfillment. One of the pleasures of teaching art history at Aoyama Gakuin University since this April is that I am able to promote the importance of such experiences. As I bring my students to the Idemitsu Museum, I would like them to handle actual objects and to discover the fun of working as a curator. In Europe there are wonderful collaborative links between museums and universities, but the situation unfortunately is not yet so in Japan, especially with regards to private museums. I would also like to deepen the relationship between children and museums. There is still this concept that museums are spaces reserved for adults and this applies to the Idemitsu Museum as well. Even if it is only once or twice a year, I would like an event that families can enjoy together. Another project I would like to develop, though it may take a little longer to realize, is a special Idemitsu collection exhibition overseas. 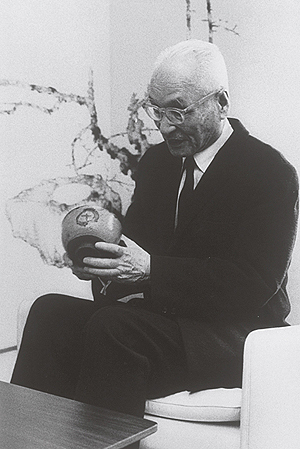 Looking back, Sazo – with the help of the philosopher Suzuki Daisetsu – travelled around Europe with the Sengai exhibition in the 1960s. This, no doubt, helped fuel the Zen boom there. Superb art objects are the quintessential cultural ambassador. It would be wonderful to be able to show the treasures of the Idemitsu Museum to those living overseas who might not be able to travel to the Japan. 1. Sengai Gibon (1750-1837) is a Zen monk from the Rinzai school, one of the three main branches of Zen Buddhism. He was abbot of Seifukuji temple in Hakata, which is the oldest Zen temple in Japan. The Idemitsu Museum holds approximately 1,000 works by Sengai, making it the largest collection of its kind in Japan.